Her Husband’s Lover by Julia Crouch is an absolutely brilliant psychological thriller. It begins with a bang, literally, as Louisa’s car with her children in the back is forced off the road by her husband’s car and crashes. Her husband, Sam, is killed in the accident and as Louisa manages to crawl free, her car erupts in a fireball. We next meet her as she is rebuilding her life following many months in hospital and having had counselling to help her get over the trauma and grief. 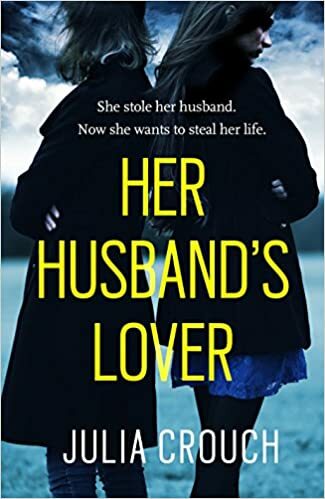 But this story isn’t just about Louisa: it’s also about Sophie, her husband’s lover, and how she seems intent on tracking Louisa down and ruining what is left of her life. This story was so cleverly constructed. Of course to begin with, my sympathies lay entirely with Louisa. How could they not be after what she had gone through, losing her husband and children? Sophia seemed like a money-grabbing home wrecker who had caused all the awful events to happen. The story unfolds through the eyes of both characters in the past and the present with so many twists that I really didn’t know who to believe or trust. In the last few heart-racing chapters I literally had no idea what was going to happen and felt my tension levels rise. By then, all had been revealed about what had really happened and just who was telling the truth but how would it all end? This book is definitely up there as one of the best psychological thrillers I’ve read. It totally messed with my mind so that I didn’t know if I could believe what each character was telling me or not. For me, it was the epitome of a page turner and genuinely a book I couldn’t put down. I highly recommend this if you enjoy psychological thrillers and are looking for a totally gripping read. I’m sure this book will be huge this year!